Display is scientific, 10 digits mantissa & 2 digits exponent, amber gas discharge, Burroughs Panaplex II. Integrated circuit - Rockwell A4800PC, here date-coded week 13 of 1975. 251 mm x 194 mm x 56 mm (9.9" x 7.6" x 2.2"). Made in England, Sumlock Anita Ltd., Rockwell International. 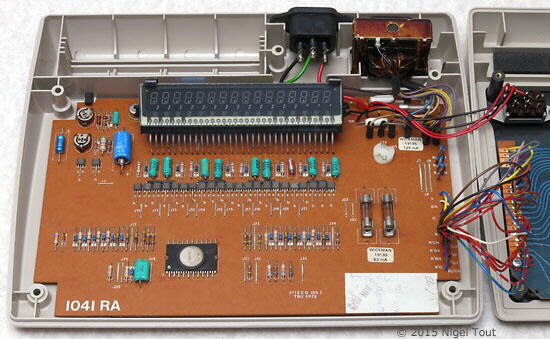 The interior of the 1041, showing the Panaplex II discharge display and the Rockwell chip. This machine was designed with room for rechargeable cells, top left, should a version needing them ever be required. The sales brochure "Calculators & Computers" (here in pdf format) of the Yugoslavian company Elektronska Industija, which obtained the design and the production facilities of ANITA calculators around 1976, shows the model Ei 1041 on p21. 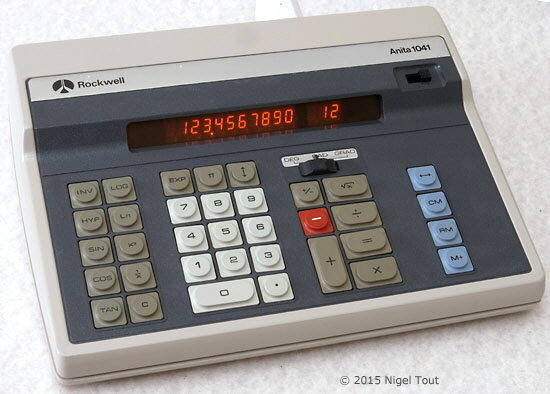 This is an updated version of the ANITA 1041 with a yellow-green display.